We share an essay by Ruymán Rodríguez that critically evaluates the radical poltical potential of the idea of community. Without defending the need to abandon the creation of communities as part of a larger anarchist political project, Rodríguez nevertheless argues that the concept, as well as the history of constructing alternative communities, is plagued by uncertainties, illusions and dangers. There is a fundamental urgency then to think through and clarify the concept, for both theory and practice. Rodríguez’s argument is not without difficulties (e.g., he seems to assume that the distinctions are clear between what is politically possible and impossible for a community, between private and public, as well as individual and group concerns, between the means and ends of revolutionary political action, when we would argue they are not, or at least not always). But the essay has the virtue of being rooted in and reflecting Rodríguez’s considerable involvement with the Federación de Anarquistas de Gran Canaria (FAGC), one of the most active anarchist collectives in spain (see: the Esperanza Commune). His is an “anarchism in the streets” whose voice cannot be easily ignored. The essay below is published on the site alasbarricadas.org (27/08/2016) and is shared here in translation to english. The majority of social movements tend to reproduce in their discourse the idea of “creating community”1. When revolutionary dreams clash with reality, it is towards the creation of alternative communities that expectations turn. At the same time, in revolutionary situations, we speak insistently, though vaguely, of setting up “communities of resistance” (in practice, emphasising more the former than the latter). We do all of this without almost ever understanding that this myth of our common imaginary also has its limits. This does not mean that I consider it something negative, or something to be banished, but yes, something to be questioned, to rethink its apparent certainties. The communitarian experiments of the late 19th and early 20th centuries also failed. These were for the most part of a libertarian nature and they spread through Italy, Spain, above all France and also to the south american countries most affected by European migration (like Argentina or Brasil). From the first examples as described by individuals such as Fortuné Henry through to their popularisation in the so-called “free media” that extended to the end of the “Belle Époque”, anarchists put much of their efforts into these experiences. Very few would survive time and the majority would destroy themselves more because of internal disintegration than as a result of State repression. One of the best documented examples was “La Cecilia” (1890-1894), a very sui generis experiment, but also very paradigmatic, made up for the most part of Italian migrants in an isolated place of Brasil. To explain all of the details of the communitarian life of this commune would call for numerous articles and this is not my intention. It is enough to state that even personally, many of the contradictions of our contemporary environments were produced, not only at the level of jealousy and pettiness, but also when it came time to force people to experiment with amorous or emotional situations for which they were not prepared (as if this signified acquiring an evolving revolutionary pedigree). At the social and economic level, egoism, vagrancy, lack of solidarity, authoritarianism, also appeared. Does it surprise us? A human community is comprised of human vices and virtues. To add to it the anarchist adjective, to be waved like an animist fetish before one, does not serve to frighten off evil spirits. We are educated as we are and even though we have wanted to eliminate many of the influences from the environment, this does not mean that they disappear altogether. A space created with libertarian ends cannot shield itself against the authority that surrounds it nor cleanse by decree the authoritarianism that its members carry within them. And even if it could, what would come of this hermetic space? 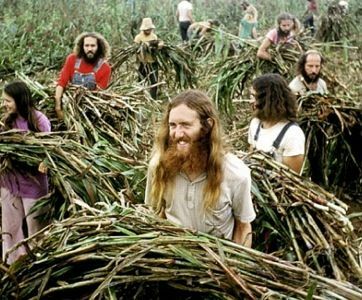 These things that Reclus pointed to, are they any different from what we have seen in all of the modern communes from those of the hippies of the 1960s and 70s to those of today? It is impossible for something to re-produce itself always, and assuredly so, without reason. We could imagine that the problem has to do with over ideological people, that with persons free of political weaknesses, that it would be different; but no. The problems are exactly the same; less sophisticated rhetorically, but identical. The question is that even if we were to create a perfect society, what would happen with the rest of society? The problem posed by Bakunin, when he affirmed that one cannot be free surrounded by slaves, has yet to be resolved.6 An isolated micro-society, with a perfect libertarian functioning, would be generally very little libertarian. A group of narrow minded “money-makers”, in Reclus’ words, obsessed with keeping afloat the small family business and who would turn the community into a corporate style company. Perhaps 15 live the mirage of freedom, but 7 billion would continue to crawl as always. None of them knew what the future would bring, as none of us know. To dispute the best model basing ourselves on theory is stupid and sterile. Only practice will settle the matter. This text therefore speaks of what historical and personal experience have demonstrated to me. A community, if it wishes to subsist, should avoid entangling itself in what I call “the politics of the impossible”. There are things that a community can vote on in assembly by majority, even by consensus, but if what is approved of escapes the possible, then it will not be carried through. To vote by absolute majority that tomorrow we are going to levitate will not get us one centimetre off the ground. The community cannot deal with matters that escape its control. If it agrees upon, for example, the hours during which noise can be made, then there will have to be a real predisposition among community members to accept the agreement, the capacity of the community to have it complied with and defined consequences, should this not occur. If analysis tells us that there is no real possibility to comply with what is agreed upon, then it is better not to propose it. And this relates with decisions taken regarding ethics and morality, the domestic private sphere and customs. However much certain habits annoy and displease, there are things whose realisation are not possible. And even if they were, would it be desirable? To be able to do so, it would be necessary to put into movement a heavy and repugnant repressive machine similar to that of the State, or a labour of pedagogy and self-education that with luck, working, would take decades. There are matters in which the community should recognise itself, even if temporarily, incompetent. With respect to the individuals who comprise it or who may on occasion approach the community, it can only deal with issues that affect what is in common, which affect the majority or that directly threaten or put the community into danger. Unless this is the case, it should restrain itself. On this point, I remember an example that occurred in the 15M acampada of Las Palmas. An assembly was called by the “Respect Commission” to see in what way a person with “inconvenient” attitudes (caused by drug abuse and serious mental problems) could be prevented from gaining access to the occupied square. Everyone spoke of expulsion and “control patrols”. When my turn to speak arrived, I posed two objections: first, the moral dilemma of exclusion, of sweeping under the carpet all of those problems that so much bother us and as this capitalist society, which we find so objectionable, also does; second, even if the majority decides that he should be impeded from participating, how can such a resolution be put into effect? A square is a public space from which one cannot be impeded access. By creating a 15M police that would constantly survey the perimeter? And in putting into practice such an aberration, resorting to violence should the individual violate the police cordon? I called attention to the fact that the same pacifists who censored self-defence in the face of police aggression approved of violence in the hour of “protecting itself” against a person burdened by multiple mental and social infirmities. I proposed that the situation of the referred to person be understood and to suggest to him, given his interest in the movement, some occupation and a way for him to engage with it. As he liked to paint, I proposed that he be charged with drawing the posters and I dedicated myself to this task during a number of weeks, until just before the eviction from the square. It wasn’t a panacea, but the problems of coexistence were lessened. There will always be disruptive individuals, elements who sabotage from within. The community must consider for itself what tools it has to confront situations like these and if it can apply them without becoming the same authoritarian model that it condemns. It should evaluate whether the individual is susceptible to persuasion or to pedagogy, if sanctioning measures are required (a dangerous path which knows no limit and which is not put into effect with words9) or if recourse to expulsion must be made. And, above all, if it has the capacity to apply any of these measures. It must also consider what is the real proportion of these disruptive elements. A community where the majority sabotage is no longer a community and the best in this case is to abandon it. The community10 should cease to see itself as an entity with a life of its own, suprahuman. It is only an inanimate structure that exists thanks to those who comprise it. Its nature, if it is negative or positive, is determined by the human quality of its components. It must be viewed as a body which is never the centre of itself; this body is composed of cells and which for good or ill, it is they that determine the good or ill health of the said body. The body can eliminate a malignant cell, extirpate a cancer, but it cannot do so without self-mutilation. Life in community is a social phenomenon that seems unquestionable; to question it would be like getting lost in questioning whether the human being is social or not by nature. Since my adolescence, the debate has held no interest for me. What interests me is only to question the limits of the model, the borders beyond which it cannot cross without gambling on its own death (to die, unfortunately, killing). From all that has been said, I don’t believe it to be appropriate, in relation to social projects, to contemplate the constitution of communities as ends in themselves. Community is a means, against which to hold up theories, to put them to the test, to make oneself stronger, to practise co-existence, conviviality, to create structure and fabric, to gain muscle in everyday and collective practice, from day to day; all of it very important, but still nevertheless a means and not a goal. To see in the creation of communities our ultimate end is like investing all of our energies in the mending of a vehicle, in the greasing and preparing of it, in making it an object fit for exposition, but without the capacity to ever start it, either because it has become a decorative thing unfit for self-motion, or because we fear that it will deteriorate during the journey. I am reminded of the so-called “Project A” promoted by Horst Stowasser in Neustadt (Germany) towards the end of the 20th century. It is an example, a demonstration of capacity, an experience with many valid lessons, but to see it as the objective, in my opinion, would be to miss the target. It is a project that effectively demonstrates what I have been saying: the necessity of strengthening the tool, of creating a powerful structure, without being aware of the loss of perspective of transforming a part into the whole. It is an example of what happens when the ends are subverted, when the methods become the goals and the resources substitute the objectives. It was ingenuously taken as a given that the revolutionary process would produce itself by itself by the sole means of reinforcing the network of self-management, that the conflict with authority would come, inevitably, with the very growth of the project. The truth is that power tends to tolerate any parallel project as long as it occupies all of the time of those involved and it doesn’t intend to interfere in any direct way with the functioning of the status quo. Sometimes, it even encourages it, leaving us to exhaust ourselves, to keep hitting the wall, or that we make our project the goal of our lives instead of it being a simple element to help us change it. In the end, the participants come to be obsessed with the good functioning of the project, to maintain its stability, to perfect it and keep it free of alterations. Only the project in itself is now of interest and to perpetuate it everything is sacrificed, including the final purpose which gave it life. The emancipatory yearnings of the beginning have disappeared, eclipsed, and what remains is the very object that we have created: the garden, the factory, the community, as the receptacle for all of our expectations. The means to a better life has become life itself. It should be a simple step towards liberation, but instead of that it transformed itself into stairs without beginning or end; a spiral staircase that turns upon itself and ends just where it began, incapable of taking us anywhere beyond itself. An acceptable surrogate for emancipation. Consequently, if we want to create communities, at a small scale (anarchist) or large communities of resistance, ample (now and forward looking), with projection in our neighbourhoods, we have to abandon the communitarian myth. In common, only the matters that affect the group as a whole can be settled; but to deal with matters that pertain purely to the personal sphere or to impose patterns of behaviour or collective practices that the community does not itself call for, is the best way to create tension and disaffection within the community. It is a phenomenon that I catalogue neither as postive nor negative, but I have noticed the following: when we okupied one or two houses in a non-okupied building and those housed have known how to adapt, there have been few problems of co-existence. Each neighbour has been autonomous, has ordered their own life and interaction has limited itself to common issues. When we okupied whole buildings or blocks and the assemblies have not known how to limit themselves to taking decisions regarding matters that affect the whole and have tried to question what each does in their home, then there have only been failures and conflicts. We could say that it is question of proportion: with less contact there are less disagreements. And, without being wrong, it also however has a great deal to do with what the community attributes to itself and its tendency to extend itself without limit in pursuit of an impossible and unattainable perfection. The previous example is comparable to almost any situation. In our media, we speak of community in the same way that north american television series and films do: an amorphous ensemble and superior to the individuals that make it up. To be a “respectable member of the community” is equivalent to respecting norms whose nature and function we are ignorant of, and this is usually neither desirable nor good. A community cannot meddle in the dimension of the purely individual – as long as it does not affect the whole – as much as what happens in the said sphere pleases or disgusts. The efforts of the participants should not go towards “creating community”, “collective sentiment”, “group belonging”, but rather reinforcing judgement, the capacity to criticise and dissent. I have said on some occasion that if today we lack solidarity, it is not because of individualism, but of gregariousness; because of adapting to the reigning lack of solidarity, because of being like everyone else. To be in solidarity, without competing or taking a cut, is a minority view and not well seen. At the level of superficial morality maybe not (“you shall not kill”), but yes, at a deeper moral level (“be politician, police or military and be respected for killing”). In a community, it is necessary to try to strengthen the independence of judgement, the desire to collaborate by conviction and not by inertia, to know how to assume opposition when the community is mistaken. None of our communities, not even the libertarian ones, have known how to do this. They have tried to force a uniformity of habits and a fictitious harmony grounded in similarity and not difference. Individuality is even lacking to immediately detect the death of the project, to know when one lives in a community and when in something else driven by the desires of a few and weighed down by the apathy and vagrancy of a majority. It is also necessary to discern when the community accepts its condition of means (to facilitate the life of its participants, to arm ourselves before the revolutionary event) and when not, and turns to transform itself into the aim of all efforts (when it demands that one work only by and for the community and does not assume that it is the trampoline that allows us to move to other revolutionary stages). To think for oneself, to know how to oppose the many, generate dissent, to feel master of one’s own life, is the price that all human community must be ready to pay to its members if it wishes to remain sane, to construct itself with real people and not be a simple abstraction foreign to the concrete beings that should give it life. 1. Throughout the text, when I allude to the term community I do so principally to refer, beyond its general meaning, to the alternative communes created at the margins of capitalist society (from the utopian of the 19th century to that of the hippies of the second half of the 20th century), that aspire to the practical demonstration of a theoretical social model. These are not to be confused with the communities created in situations of conflict, desired or not, from the English diggers of the 16th century through to the Spanish revolution of 1936 up to the most current experiences, such as that of the Zapatistas. These communities tend to be of another nature, they don’t aspire to isolation and their experimental nature needs more diffusion and contagion, movement, than static conservation. 5. Élisée Reclus, On anarchist colonies, 1900. 6. Mikhal Bakunin, The Principle of the State, 1871. 7. Max Stirner, The Ego and its Own, 1845. 8. Henry David Thoreau, Walden or Life in the woods, 1854. 9. This opens the door to Friedrich Nietzsche’s aphorism: “He who fights with monsters should look to it that he himself does not become a monster.” (Beyond Good and Evil, 1886). 10. More correctly its members, as the community neither thinks, nor feels, nor does anything by itself; it is solely the aggregate of individuals. 11. Renzo Novatore, My Iconoclastic Individualism, 1920. This entry was posted in Commentary and tagged 15M, anarchism, autonomy, community, Occupations, Okupations, Ruymán Rodríguez, spain. Bookmark the permalink.